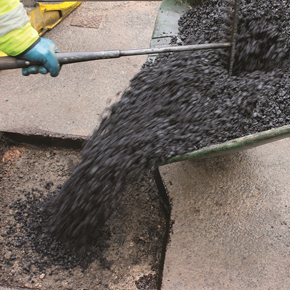 SuperTrench is the latest asphalt reinstatement product by Aggregate Industries: comprising a collection of hot mix surface course mixtures developed to help reinstate flexible footways, footpaths and cycle tracks. Available in two sizes, 6mm and 10mm, SuperTrench is designed to meet the requirements of the Specification for the Reinstatement of Openings in Highways (SROH) and is HAUC compliant. For the permanent reinstatement of flexible footways, footpaths and cycle paths, the 6mm option is recommended, whilst SuperTrench 10mm provides the ideal solution for type two, three and four flexible roads when laid with a minimum thickness of 40mm. SuperTrench has been specifically designed to combine the surface and binder courses in footways, from a minimum compacted thickness of 60mm up to a maximum of 80mm in two equal layers. The product available in loads as small as half a tonne, from a UK wide delivery network with depots located to serve utility service contractors across the country.